A black bear cub—dubbed by some “Gibson,” or “Gibbs,” for short—rests in a state Department of Environmental Conservation bear trap after being tranquilized and captured Oct. 15 in RIT’s Sol Heumann quadrangle. 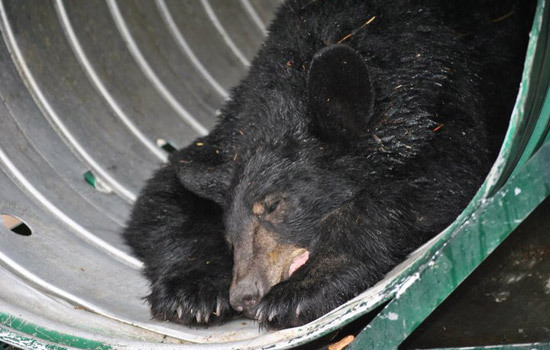 The cub was later released near a state wildlife management area in Naples, Ontario County. One might not think that in the quiet, suburban setting of a university campus, wild things are all around us. Creatures—and I don’t mean zombies—go about their business in the forested acres of RIT, while we go about our business of working, studying and socializing. Upstate New York has generous populations of animals that live in its tranquil wilds. Bear, deer, raccoons, coyotes, snakes, foxes, weasels, skunks and squirrels are native to much of the state and a regular part of many urban and suburban areas. According to the New York State Department of Environmental Conservation, black bears are prevalent in the Adirondacks, Catskills and Allegany regions of New York State. “In recent years, these bears have been increasing the size of their range outside of these core areas,” according to the state Department of Environmental Conservation in 2006. The RIT community knows this all too well with the recent wandering of a black bear yearling onto campus. Black bears don’t generally engage with humans, but they will find—and stay with—a good food source, even if it is associated with humans (such as garbage, bird seed or pet food in people’s yards). Black bears are generally shy, but they can be unpredictable if cornered or if the bear has cubs. • Use extreme caution at dawn and dusk when deer are most active. • Be more aware of deer during October and November. • Scan the shoulders of the roadside for deer eyes reflecting light. • Do not rely on high beams or honking your horn to warn deer. • Slow down when approaching deer standing at the roadside; they may suddenly bolt into the road. • Deer often travel in pairs or groups, so if a deer is spotted crossing the road, slow down and be alert that others may follow. • Always buckle your seat belts. Ejection from a vehicle is the main reason that fatalities occur in a collision. • If a collision is unavoidable, hold onto the steering wheel; do not swerve to avoid hitting the deer. Bring vehicle to a complete stop. The most serious vehicle-deer accidents occur when drivers swerve at high speeds to elude a deer, and then strike another vehicle or a tree or they roll over. Most of the small mammals commonly seen around campus are no cause for worry. Nocturnal mammals, such as coyote, fox, skunks and raccoons, become active at dusk or dark. They generally do not come out during the day but will when they are attracted by food. When one does move around during the day there is a chance the animal may be rabid. An animal that is rabid will exhibit behaviors like unusual aggressiveness or passivity, excessive drooling and mobility problems. If a generally nocturnal animal is sighted during the day, it is best to stay away from it and call the authorities. Encountering wildlife doesn’t need to end tragically, either for humans or for the animals. Should you come in contact with a bear or other animal you don’t generally see around campus during the day, it is best to avoid the animal and contact the authorities (9-1-1 or Public Safety at 585-475-3333 or RITPUBLICSAFETY on AIM). 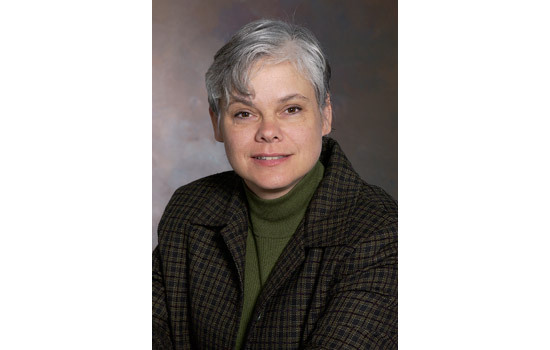 Lynn Daley is director of business continuity, RIT Global Risk Management Services. “Viewpoints” presents insight and opinions on issues of relevance to RIT or higher education generally. To suggest a topic for a future essay, contact news&events@mail.rit.edu.